Even before the completion of the human genome project, studies in the lab have focused on using comparative genomic data to resolve the evolutionary relationships within and between major mammalian lineages, as an evolutionary framework to understand mechanisms of chromosome evolution. Figueiró, H.X., Li, G., Trindade, F.J., Assis, J., Pais, F., Fernandes, G., Santos, S.H.D., Hughes, G.M., Komissarov, A., Antunes, A., Trinca, C.S., Rodrigues, M.R., Linderoth, T., Bi, K., Silveira, L., Azevedo, F.C.C, Kantek, D., Ramalho, E., Brassaloti, R.A., Villela, P.M.S., Nunes, A.L.V., Teixeira, R.H.F., Morato, R.G., Loska, D., Saraguëta, P., Gabaldón, T., Teeling, E.C., O’Brien, S.J., Nielsen, R., Coutinho, R.L., Oliveira, G., Murphy, W.J., and E. Eizirik. 2017. Genome-wide signatures of complex introgression and adaptive evolution in the big cats. Science Advances 3: e1700299. Mason, V.C., Li, G., Minx, P., Schmitz, J., Churakov, G., Doronina, L., Melin, A.D., Dominy, N.J., Lim, N. T-L., Springer, M.S., Wilson, R.K., Warren, W.C., Helgen, K.M., and W. J. Murphy. 2016. Genomic analysis reveals remarkable hidden biodiversity within colugos, the sister group to primates. Science Advances, 2: e1600633. Li, G., Davis, B.W., Raudsepp, T., Pearks Wilkerson, A.J., Mason, V.C., Ferguson-Smith, M.A., O’Brien, P., Waters, P., and W. J. Murphy. 2013. Comparative analysis of mammalian Y chromosomes illuminates ancestral structure and lineage-specific evolution. Genome Research 23: 1486-1495. Janečka, J. E., Miller, W., Pringle, T. H., Wiens, F., Zitzmann, A., Helgen, K. M., Springer, M. S., and W. J. Murphy. 2007. Molecular and genomic data identify the closest living relative of primates. Science 318: 792-794. Murphy, W. J., Larkin, D., Everts van-der Wind, A., Bourque, G., Tesler, G., Auvil, L., Beever, J. E., Chowdhary, B. P., Galibert, F., Gatzke, L., Hitte, C., Meyers, S. N., Ostrander, E. A., Pape, G., Parker, H. G., Raudsepp, T., Rogatcheva, M. B., Schook, L. B., Skow, L. C., Welge, M., Womack, J. E., O’Brien, S. J., Pevzner, P. A., H. A. Lewin. 2005. Dynamics of mammalian chromosome evolution inferred from multispecies comparative maps. Science 309: 613-617. Murphy, W. J., Pevzner, P. and S. J. O’Brien. 2004. Mammalian phylogenomics comes of age. Trends in Genetics 20: 631-639. A major focus in the lab is developing and applying genomic resources for the cat family to connect genotype to phenotype, and reveal the evolutionary consequences of historical and contemporary hybridization between species. Li, G., Hillier, L.W., Grahn, R.A., Zimin, A., Makunin, A., David, V.A., Menotti-Raymond, M., Hannah, S., Hendrickson, S., O’Brien, S.J., Minx, P., Wilson, R.K., Lyons, L.A., Warren, W.C., and W.J. Murphy. 2016. 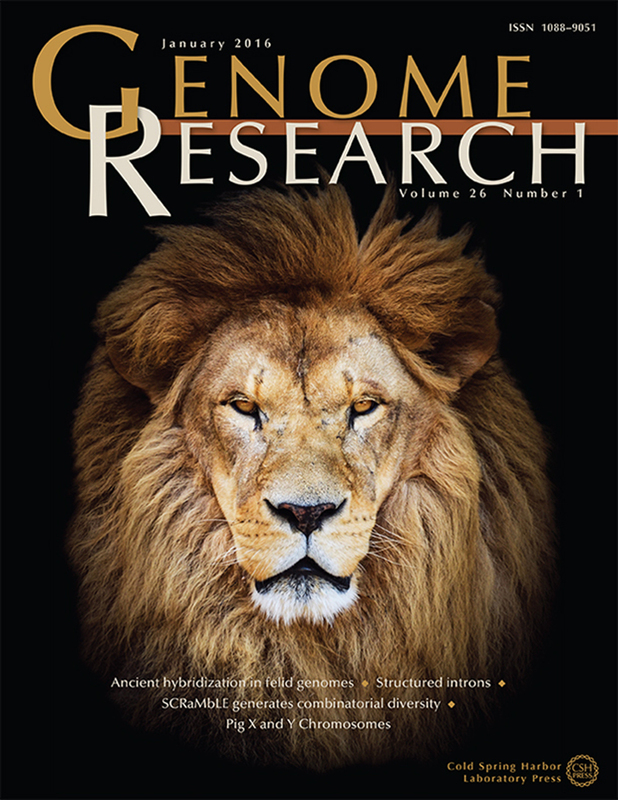 A high-resolution SNP array-based linkage map anchors a new domestic cat draft genome assembly and provides detailed patterns of recombination. G3: Genes Genomes & Genetics, 6: 1-10. Li, G., Davis, B.W., Eizirik, E., and W.J. Murphy. 2016. Phylogenomic evidence for ancient hybridization in the genomes of living cats (Felidae). Genome Research 26: 1-11. Davis, B.W., Seabury, C.S., Brashear, W., Li, G., Roelke Parker, M., and W.J. Murphy. 2015. Mechanisms underlying mammalian hybrid sterility in two feline interspecies models. Molecular Biology and Evolution 32: 2534-2546. Montague, M., Li, G., Gandolfi, B., Khan, R., Aken, B.L., Searle, S.M.J., Minx, P., Hillier, L., Kolboldt, D.C., Davis, B.W., Driscoll, C.A., Barr, C., Blackstone,K., Quilez, J., Lorente-Galdos, B., Marques-Bonet, T., Alkan, C., Thomas G.W.C., Hahn, M.W., Menotti-Raymond, M., O’Brien, S.J., Wilson, R.K., Lyons, L.A., Murphy, W.J., and W. C. Warren. 2014. Comparative analysis of the domestic cat genome reveals genetic signatures underlying feline biology and domestication. Proceedings of the National Academy of Sciences USA 111: 17230-17235. Davis, B. W., Raudsepp, T., Pearks Wilkerson, A. J., Agarwala, R., Schäffer, A. A., Houck, M., Chowdhary, B. P., and W. J. Murphy. 2009. A high-resolution cat radiation hybrid and integrated FISH mapping resource for phylogenomic studies across Felidae. Genomics 93: 299-304. O’Brien, S. J., Menotti-Raymond, M., Murphy, W. J., and N. Yuhki. 2002. The feline genome project. Annual Reviews of Genetics 36: 657-686. We use phylogenetic approaches to understand when and how mammals diversified, and to aid in the delimitation of species and conservation units for management. Mason, V.C., Helgen, K.M., and W.J. Murphy. 2018. Comparative phylogeography of forest-dependent mammals reveals paleo-forest corridors throughout Sundaland. Journal of Heredity Sep 21. doi: 10.1093/jhered/esy046. Janečka, J.E., Janecka, M.J., Helgen, K.M., and Murphy W.J. 2018. The validity of three snow leopard subspecies: response to Senn et al. Heredity 120: 586-590. Janečka, J.E., Zhang, Y-Q., Li, D-Q., Munkhtsog, M., Munkhtsog, B., Galsandorj, N., Wangchuk, T.R., Karmacharya, D., McCarthy, T., Gaur, A., Kumar, S., Hussain, S., Muhammad, G., Jevit, M., Hacker, C., Burger, P., Wultsch, C., Janečka, M. J., Helgen, K.M., Murphy, W.J., and R. Jackson. 2017. Range-wide snow leopard phylogeography supports three subspecies. Journal of Heredity 108: 597-607. Springer M.S., Emerling, C.A., Meredith, R.W., Janečka, J.E., Eizirik, E., and W.J. Murphy. 2017. Waking the undead: implications of a soft explosive model for the timing of placental mammal diversification. Molecular Phylogenetics and Evolution, 106: 86-102. Meredith, R. W., Janečka, J.E, Gatesy, J., Ryder, O. A., Fisher, C.A., Teeling, E.C., Goodbla, A., Eizirik, E., Simão, T. L. L., Stadler, T., Rabosky, D. L., Honeycutt, R. L., Flynn, J. J., Ingram, C. M., Steiner, C., Williams, T. L., Robinson, T. J., Burk-Herrick, A., Westerman, M., Ayoub, N. A., Springer, M. S., and W. J. Murphy. 2011. Impacts of the Cretaceous Terrestrial Revolution and KPg Extinction on mammal diversification. Science 334: 521-525. Teeling, E. C., Springer, M. S., Madsen, O., Bates, P., O’Brien, S. J., and W. J. Murphy. 2005. A molecular phylogeny for bats illuminates biogeography and the fossil record. Science 307: 580-584. Murphy, W. J., Eizirik, E., Johnson, W. J., Zhang, Y. P., Ryder, O. A., and S. J. O’Brien. 2001. Molecular phylogenetics and the origins of placental mammals. Nature 409: 614-618.